I honestly really don't like dust masks. I typically just go the bandana route.. and really don't end up even using THAT enough while I'm in BRC. Both a mask and a bandana fogs up goggles OR my eye glasses which is just annoying. I typically end up not even using a bandana enough (ALWAYS during a dust storm though) and end up getting so much dust in my lungs that it takes a month to get it out. (I'm not sick, I know what dust in my lungs feels like). So, I'm wondering if the allergy filters would work. Anyone ever try them? I can't see why they wouldn't. They are meant to catch particles MUCH smaller then playa dust. I'm looking at these filters on that evil huge shopping website. I know Id probably have to wash or replace the filters more often of course. Re: Anyone ever try the allergy in-nostril filters? I don’t see how those will help in a Playa dust storm. The physics are all kinds of wrong for the BM environment. Any good filter has big surface area. Think of the pro painters masks with the two big cylinder cartridges... Even those guys are hard to breathe through. I’m sure the nose plug thins help with pollen and such when someone puts a bouquet of flowers next to the salsa bowl but not on the Playa. Not when the dust is thick in the air. It may help if worn with a damp bandanna tho but then you’re back to the foggy goggles/glasses. Ten years of Playa jack-assery later this remains an unsolved problem for me as well. See and breathe dust or fog up and wear some kind of breathing apparatus. Search for the size of pollen. Then search for "particle camp" "playa dust." An old playa buddy swears by these. YMMV. Token, the filter would just be for everyday use while on the playa. A dust storm would of course require more heavy duty face covering. 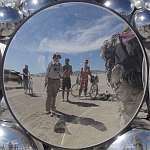 It's been my experience that there is almost always some level of dust in the air while at BRC... I'd think these would help with that. Shrug, I didn't look it up but; I think of it this way. Most of the pollen people are allergic to is microscopic and can't be seen with the naked eye. You can totally see playa dust. Therefore, it is bigger and would be filtered. Nice thoughts. However, 65% of playa soil is smaller than the smallest pollen. And over 86% of playa soil is smaller than Ragweed. The smallest pollen grain: 5 µ × 2.4 µ as observed in pollen of forget-me-not (Myosotis spp.). Ragweed - one of the more common allergens - has pollen grains ranging from 16-27 microns. Wind-borne pollen grains can be as large as about 90–100 µm. fine clay or other soil components (SiO2, Al2O3, quartz, micas, calcite, feldspar, vermiculite, illite, and kaolinite), aquatic micro-fauna eggs or dead body parts, bacteria normally on the playa, bacteria deposited by migratory birds, bacteria blown in off of surrounding land and the bacteria in the water that the water trucks spray on the dusty BRC roads.